The Chi Lin is a heavenly creature with a wonderful combination of a Dragon head and a horse body to produce a harmonized mixture of excellent qualities between the two auspicious animals. It has a more royal status compared to the other guardians. They are simply charming. Chi Lin blows cosmic chi because of its Dragon head to benefit surrounding Feng Shui. The Chi Lin is loyal to its owner and easier to tame like a lovely horse. Its energy represent strength, great ambitions, good competing spirits, great health, perseverance and fame. Besides, it also has the scales of a carp to bring prosperity and abundance. The patterns on its back were used to derive the earlier heaven bagua, an ultimate symbol in the study of Feng Shui. Favored by Classical Feng Shui Masters, the Three Chilins are known as the best remedy and most authentic method for countering 3-Killings affliction. It is known to be the easiest way to arrest this "Three Robbers' energy" in any living space. The Chilin embodies magic, representing divinity, power and good fortune. Large in size, thick and heavy, these colorful brass pieces sparkle in crystal colors and vibrant gold, exerting quality metal energy where classical masters claim to be a necessity for fighting the 3-Killings. Beautiful and dainty, it serves as a neat, tidy and classy looking hanging for modern homes. The remedy will protect you from legal problems, violences, lawsuits, gossips, scandals, backstabbings, obstacles, prevent accidents/losses, enhance good fortune and bring in good luck. Apart from protecting you, it is also able to axe away your opponents, enemies, competitors or evil counterparts. For example in 2019, the 3-Killings come from the west direction, therefore display them in the west. If you have a west door, hang them at the door. The "Three Celestial Guardians" (consisting of the immaculate Chilin, Fortune Pi Yao and Fierce Fu Dog) are an effective remedy in countering the 3-Killings jeopardy. These divine creatures can wield their miraculous powers to dispel the "three robbers" (3-Killings). The 3-Killings imply loss of good name, loss of wealth and loss of health/life. The Immaculate Chilin is said to protect you from loss of favorable reputation, the Fortune Pi Yao to protect from loss of money and the Fu Dog to protect against mishaps. Finely crafted esthetically, these superb quality pieces sparkle in vibrant colors and exert metal energy where classical masters claim to be a necessity for fighting the 3-Killings. Inspired by the need to activate its true potential and power, a shy energy infused tag is hidden under every piece. Beautiful and dainty, it serves as a neat, tidy and classy looking decorative for modern homes. The remedy will protect you from legal problems, violences, lawsuits, gossips, scandals, backstabbings, obstacles, prevent accidents/losses, enhance good fortune and bring in good luck. Apart from protecting you, it is also able to axe away your opponents, enemies, competitors or evil counterparts. For example in 2018, the 3-Killings come from the north direction, therefore display them in the north. In 2018, we need authentic cure like this to remedy the north because the north is a "double disaster" corner when the 3-Killings combine together with Fatality #5 Yellow. Next, this 2-in-1 amulet also incorporates the authentic Multicolored 5 Element Pagoda which is known to be the most promising remedy against the #5 Yellow. Inscribed with the Chien Hexagram (meaning big metal and luck from heaven) and the wulou, it exerts strong metal energy to counter earth energy from #5 Yellow. Favored by Classical Feng Shui Masters, the Three Chilins are known as the best remedy and most authentic method for countering 3-Killings affliction. It is known to be the easiest way to arrest this "Three Robbers' energy" in any living space. Featured in a victorious gesture, the flying Chilin with wings embodies magic, representing divinity, power and good fortune. Large in size, thick and heaviest among our selections, these colorful brass pieces sparkle in crystal colors and vibrant gold, exerting quality metal energy where classical masters claim to be a necessity for fighting the 3-Killings. Beautiful and dainty, it serves as a neat, tidy and classy looking hanging for modern homes. The remedy will protect you from legal problems, violences, lawsuits, gossips, scandals, backstabbings, obstacles, prevent accidents/losses, enhance good fortune and bring in good luck. Apart from protecting you, it is also able to axe away your opponents, enemies, competitors or evil counterparts. For example in 2019, the 3-Killings come from the west direction, therefore display them in the west. If you have an north door, hang them at the door. Plated in real gold with a classy touch, this immaculate pendant opens up opportunities for better fortune, higher position in office, examination luck and conceiving a baby boy. The popular Chilin represents strength, great ambitions, good competing spirits, great health, perseverance and fame. It has the scales of a carp signifying prosperity and abundance. The Chilin will also bless those who are seeking for an illustrious baby son. It was said that Confucious was born after his mother walked on the footsteps of the Chilin. It also benefits adults seeking for higher positions and for kids seeking for better luck in examinations. The patterns on its back were used to derive the earlier heaven bagua, an ultimate symbol that will bring protection against bad energies caused by bad Flying Stars. It provides immunity for anyone who is affected by bad flying stars due to the 'natal chart', the 'annual chart' or the 'monthly chart' either at home or at the work area but unable to put cures at those spaces that are being regularly used. Moreover, it is also a personalized cure for unlucky stars that visit the 12 earthly branches affecting the 12 zodiacs' constellation every year. The reverse side of the pendant is inscribed with the taoist talisman of "WISHFULFILLING". The Three Celestial Protectors (Immaculate Chilin, Fortune Pi Yao and Fierce Fu Dog) is one of the most popular remedies for countering the 3-Killings affliction. These divine creatures can effectively arrest the "three robbers" energy (3-Killings). 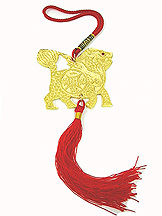 The Immaculate Chilin is said to protect loss of favorable connections, the Fortune Pi Yao to protect loss of money and the Fu Dog to protect against bloodshed. Stunningly unique, these colorful brass pieces sparkle in fresh and vibrant gold which exert quality metal energy where classical masters claim to be a necessity for fighting the 3-Killings. Inspired by the need to activate its true potential and power, a shy energy infused tag is hidden under an exquisite pendant of the mystic knot. Beautiful and dainty, it serves as a neat, tidy and classy looking hanging for modern homes. The remedy will protect you from legal problems, violences, lawsuits, gossips, scandals, backstabbings, obstacles, prevent accidents/losses, enhance good fortune and bring in good luck. Apart from protecting you, it is also able to axe away your opponents, enemies, competitors or evil counterparts. For example in 2019, the 3-Killings come from the west direction, therefore display them in the west. If you have a north door, hang them at the door. A stunning legendary emblem, this brilliant design captures the powerful bond between the Hotu and Luoshu. The Hotu Luoshu is the glorious chi lin being supported by the slower pace but hardship withstanding tortoise. This combination marries the qualities of both celestial animals together. This is a traditional cure used by olden days feng shui master to cure astrological conflicts. It is from the patterns on their backs that all classical feng shui formulas were derived. This powerful emblem has the effect of taming the ferocity of zodiac clashes. Forging closer bonds, you will get along well with all zodiacs including your enemies, thus benefitting you with glowing interpersonal relations. Zodiacs with moderate and difficult compatibility will most likely end up as your opponent, rival, enemy, foe, nemesis, antagonist, combatant, challenger, contender, competitor, opposer or fellow contestant. Zodiac adversaries can generate hatred, moments of tantrums, negative phases, exhaustion, hostility and defeat. They can be your life partner, your own children, family members, relatives, friends, co-workers, bosses or business associates. Next, the essential Bagua Horoscope Coin provides powerful protection and safeguard against numerous obstacles for all the 12 zodiacs. It combines 2 potent symbols of protection: 8 trigrams of the bagua and 12 earthly branches of animal zodiacs. Furthermore, empowering the amulet is the mantra coin inscribed with sacred mantras of good fortune, immunity against loss and shielding off dark forces. They are the mantras of Avolekitesvara, Yellow Jhambala and Goddess of White Umbrella. These sacred mantras provide a special channel to the cosmic realm to invoke divine help. Inspired by the need to activate its true potential and power, a shy energy infused tag is hidden under an exquisite pendant of the mystic knot. Note: This amulet is energy infused and emits energy unendingly. Item comes with certificate of authenticity. Carved from natural jade, this pair of "Chilins of Flourishing Aspirations" embody the scales of a carp and the head of a dragon. The chilin is actually a heavenly version of the horse. It is favored in the sheep's year because the horse is the sheep's secret friend according to theory of "Liu He". The presence of the chilin therefore makes the sheep's year happy, resulting in all aspirations being fulfilled. Favored by lineage practitioners and old timers, the chilin overides the piyao in financial stimulation because this celestial animal was documented in the I-Ching. Remember that it is from the chilin that all formulas of luck and fortune were derived. It blesses one with windfall luck, quick money in times of financial depression and rapid replacement of what has been lost. Biting in their mouths are 2 powerful talismans of taoist incantaions for; 1. Benefactors Luck and 2. Anti-Troubles. Tied gracefully on their necks are the triumphant elephants to symbolize the protection of wealth made from being lost. This breathtaking combination will cast positive influence on your luck to build a vibrant and awesome path of promising career, wealth and quick cashflow. Are you frustrated with your home's or premises' flying star chart? Worry no more now! Not everyone can enjoy perfect natal flying star chart according to their desire and also there are bound to be some sectors out of the 9 grids of their charts that seems to be imperfect. Now, there is no need for you to worry anymore. Immaculate and dainty, this Chilin is promised to stay fresh always for many years to come. There is a miniature Ho Tu sign with numbers adorned its body. Consecrated by a "Taoist Incantation of Protection and Home Safety", the Chilin is fully empowered to effectively remedy your feng shui. Further adorned on the other side of the body is the auspicious Mystic Knot to usher in wealth and abundance. The use of Ho Tu is in accordance to the research work of the ancient Classical Feng Shui text that is recognized by all Flying Star Feng Shui Masters, to remedy ALL flying star problems you are facing and promote only fortunate and lucky energy. The Three Celestial Protectors (Immaculate Chilin, Fortune Pi Yao and Fierce Fu Dog) is one of the most popular remedies for countering the 3-Killings affliction. These divine creatures can effectively arrest the "three robbers" energy (3-Killings). 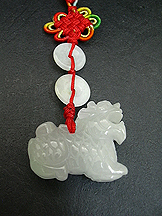 The Immaculate Chilin is said to protect loss of favorable connections, the Fortune Pi Yao to protect loss of money and the Fu Dog to protect against bloodshed. Beautiful and dainty, these brass pieces sparkle in fresh and colorful enamel, and exert quality metal energy in which classical masters claim to be necessary for fighting the 3-Killings. Inspired by the need to activate its true potential and power, a shy energy infused tag is hidden under the base. Careful attention has been paid to every detail. The remedy will protect you from legal problems, violences, lawsuits, gossips, scandals, backstabbings, obstacles, prevent accidents/losses, enhance good fortune and bring in good luck. Apart from protecting you, it is also able to axe away your opponents, enemies, competitors or evil counterparts. In 2019, the 3-Killings come from the west direction, therefore display them in the west. The Chi Lin depicted successfully grasping the pearl (symbolize by a red sphere) denotes "effortlessly reaping rewards". You will have full grip and control of your fortune and luck. It is from the Chi Lin that all the formulas of luck and fortune were derived, characterized by its omnipotent abilities and power to have full control of the future. When the path forward is under full control, you will attain all time victory. Nothing will be restrained and nothing will hold you back from moving forward with ease. The Chi Lin will help to revive suffering businesses, to regain wealth that has been lost, to increase cashflow and financial luck quickly for the family, to assist in clearing off debts quickly and to provide a smooth wealth recovery. Once financial flow is stable, it will help improve luck in your investment thus making you rich and wealthy in the long run. Display it in prime areas such as the living room or near to the maindoor. This exquisite one-horned chilin shines elegantly in three kinds of natural lights ("san kwang"), the sparkling star, the bright sun and the radiating moon. To the unknowing eye, one will not notice this is actually a one-horned chilin. Perched gracefully on its glowing scales is the fortune bat, a strong symbol of good fortune. Supporting the chilin on its back is a stunningly designed 3-legged money frog with gleaming eyes. This breathtaking combination will cast positive influence on your luck to build a vibrant and awesome path forward for you. Hidden within the fat stomach of the frog is a secret compartment where you can open and fill it with fortune bringing six emperor coins of windfall. Inspired by the need to activate its true potential and power, a shy energy infused tag is hidden under the combination. The Chief Official Seal features the magnificent Chilin to bring blessings of career advancement, salary increment, promotion, prosperity and good luck. The Chilin, which needs no introduction as a powerful symbol of good fortune, when made into a seal brings support from powerful people, as well as mentor and wealth luck. It connotes blessings from the heavenly officer. To the chinese, a seal was for many centuries a symbol of power, used by government officials as the indication of power and authority. Only those who were high ranking officers were given the seal by the emperor. Thus the seal has become a strong symbol of power, influence and good fortune. Therefore it can be translated to be used by wage earners who wish to magnify their luck for career enhancement and promotional luck. This is therefore an excellent symbol to bring good rewards to ones career. A career cannot be considered rewarding if one is in the same position for many years or without any increment. Note: This item is energy infused and comes with a certificate of authenticity. .
1. When one is affected by bad flying star combinations due to the 'natal chart' or the 'annual chart' or the 'monthly chart' either at home or at the work area. Sometimes even if the natal chart or the annual chart is perfect for the year, but the monthly chart can ruin your good luck before you are aware of it because of your busy schedule. Therefore, this amulet will safeguard you from such problems at all times. 2. Also worth taking note that this is also a traditional cure used by olden days feng shui master to promote fortune and lucky energy for those whose astrological sign is affected by astrological enemies. For example if you are a rat and your astrological enemy is the horse, but you have children, siblings, lover, parents or other important persons born under this sign, you can carry along this amulet to resolve the problem. If you have co-workers, business associates or bosses whose signs are your astrological enemies, you can also carry along this powerful amulet to resolve the problem. 3. There are certain unlucky stars that visit the 12 earthly branches affecting the 12 zodiacs luck every year. Examples of these stars are White Tiger, Tian Xing, Lu Kong, Xun Kong, Tian Lao etc. Each of these stars are capable of ruining ones life altogether, leaving one miserable. To lessen the problems associated to them, one can carry along this amulet to prevent them from disturbing you. Carrying this along with you will safeguard you from such problems in case you are not aware of them. These energy infused Three Chilins and plated in 24K gold can be considered heavy duty enough to counter the 3-Killings affliction effectively for homes with areas up to 3500 sq feet. Made from quality brass, it exerts quality metal energies which classical masters claim to be a necessity for fighting 3-Killings. They are exquisitely designed to triumph over the 3-Killings affliction. 1. Mountain - The 3-Killings are depicted as 3 Robbers in the mountain. The Chilin stepping on the mountain connotes it is in full control and in-charge of the mountain. It represents triumph over attacks and victory over the 3-Killings. a. Vase - pronounced as "ping" to represent harmony. This will resolve disputes. b. Ingot and string of coins - this wealth symbols will prevent financial losses. c. Brush and seal - they are needed to seal over agreements carefully so as not to invite lawsuits. These energy infused Three Chilins and plated in 24K gold can be considered heavy duty enough to counter the 3-Killings affliction effectively for homes with areas up to 3500 sq feet. Made from quality brass, it exerts quality metal energies which classical masters claim to be a necessity for fighting 3-Killings. They are exquisitely designed with three secret weapons to triumph over the 3-Killings affliction. 1. Lotus Shield - a protective attribute of defense borne by deities such as Vajrabhairava, Kalachakra, Vajravega and Red Ganapati. It represents triumph over attacks and victory over all enemies. 2. Enemy Axe - It has a curve blade of the wrathful deities sealed with two half vajra heads symbolizing its indestructible thunderbolt nature. It symbolizes the severing of all negativities and especially powerful to decapitate malignant demons and enemies. 3. Makara Banner - Used to instill fear in the enemy and victory over the enemies, four maras and five poisons. The remedy will help you remove legal problems, violences, lawsuits, gossips, scandals, backstabbing, obstacles, prevent accidents/losses, enhance good fortune and bring in good luck. Apart from protecting you, it is also able to axe away your opponents, enemies, competitors or evil counterparts. The Hotu Luoshu is the glorious chi lin being supported by the slower pace but hardship withstanding tortoise. This combination marries the qualities of both celestial animals together. This is a traditional cure used by olden days feng shui master to cure astrological conflicts. It is from the patterns on their backs that all classical feng shui formulas were derived. This powerful emblem has the effect of taming the ferocity of zodiac clashes. Forging closer bonds, you will get along well with all zodiacs including your enemies, thus benefitting you with glowing interpersonal relations. Zodiacs with moderate and difficult compatibility will most likely end up as your opponent, rival, enemy, foe, nemesis, antagonist, combatant, challenger, contender, competitor, opposer or fellow contestant. Zodiac adversaries can generate hatred, moments of tantrums, negative phases, exhaustion, hostility and defeat. They can be your life partner, your own children, family members, relatives, friends, co-workers, bosses or business associates. Ancient texts had mentioned that each time the unicorn was sighted, an illustrious offspring will be born. It was mentioned in ancient texts that Emperor Yao, Emperor Shun and Confucius were born after the unicorn appeared. Some said the mother of Confucius became pregnant when she followed the footsteps left by the unicorn in a temple. This being the reason why if one ever go to chinese temples to pray for a child, the authentic fortune tellers and taoist masters would always recommend the figurine of the unicorn to be brought back home. This unicorn carries two kids on its back, a boy and a girl. Meanwhile, the boy is connoted holding a huge Ru Yi to represent outstanding achievement in future. On the other hand, the girl holds a tangerine for good fortune. This heavy metal figurine is best displayed in the west corner of the house where the descendant luck is. The west corner belongs to metal element. 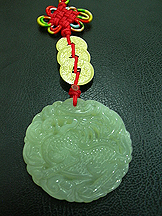 This Chi Lin is beautifully carved from jade stone. It is further strung with three gold emperor coins of Kang Hsi, Yong Cheng and Chien Lung for amplified good luck. The beautiful design would make this amulet a handsome gift for your loved ones. The Chi Lin represents strength, great ambitions, good competing spirits, great health, perseverance and fame. Besides, it also has the scales of a carp to bring prosperity and abundance. Also worth taking note that the patterns on its back were used to derive the earlier heaven bagua, an ultimate symbol in the study of Feng Shui. Therefore this symbol will bring protection against bad energy caused by bad Flying Stars. Recommended to be used as a neutralizer for those staying in bedrooms in a bad flying star combo location or for those living in houses where there is bad flying stars in the sitting and facing location of the house. The Chi Lin will also bless those who are seeking for an illustrious baby son if you carry it along with you all the time. It was said that Confucious was born after his mother walked on the footsteps of the Chi Lin. 1. Growing up kids and adolescents who are naughty, rebellious, problematic and unobedient. 2. Siblings who are always quarreling and fighting causing havoc at home. 3. Kids, adolescents and adults seeking to increase literary excellence and wisdom. 4. Doctors, engineers and scientists who are working on technical projects. Ancient texts had mentioned that each time the unicorn was sighted, an illustrious offspring will be born. It was mentioned in ancient texts that Emperor Yao, Emperor Shun and Confucius were born after the unicorn appeared. Some said the mother of Confucius became pregnant when she followed the footsteps left by the unicorn in a temple. This being the reason why if one ever go to chinese temples to pray for a child, the authentic fortune tellers and taoist masters would always recommend the image of the unicorn to be brought back home. The unicorn carries the kid on its back while it is biting a magical scroll to bless the child with good educationluck. Meanwhile, the smiley kid is connoted holding a huge Ru Yi to represent outstanding achievement in future. Antique collectors will love the figurine as it is intentionally finished with antique looking rosewood color! This is a potent Feng Shui gold brass Unicorn that can exert strong metal energy. It is convenient for carrying along or hanging on walls, doors, windows and office areas. It has a large chinese coin pattern engraved on the stomach to signify money in our homes.Tied with red strings and tassels, the unicorn had been empowered and activated with potent energy. This item is most suitable to dissolve bad effects of Three Killings. You can also hang it outdoor, near the entrance, in the living room or in the family room to activate lots of good fortune. This new jade Chi Lin is made from better quality jade, has better craftmanship and has a bigger size compared to our old revision.The energy from this carry-along Chi Lin represents strength, great ambitions, good competing spirits, great health, perseverance and fame. Besides, it also has the scales of a carp to bring prosperity and abundance. Also worth taking note that the patterns on its back were used to derive the earlier heaven bagua, an ultimate symbol in the study of Feng Shui. Therefore this symbol will bring protection against bad energy caused by bad Flying Stars. Recommended to be used as a neutralizer for those staying in bedrooms in a bad flying star combo location or for those living in houses where there is bad flying stars in the sitting and facing location of the house. The Chi Lin will also bless those who are seeking for an illustrious baby son if you carry it along with you all the time. It was said that Confucious was born after his mother walked on the footsteps of the Chi Lin. This is a rare version of pair bronze Chi Lin sitting on gold ingots and treasure. This gesture represents the chi lin guarding your treasures. And this chi lin is suitable for internal security such as placing them on top of your safe and locks. They will generate more wealth and good fortune from heaven for you besides guarding them against theft. This is a pair of golden bronze guardian Chi Lin, especially useful to guard entrances of homes and business premises if they are placed facing outwards from your building or by both left and right sides of the door. The male holds a globe to signify global network and fortune coming from all directions. Meanwhile the female holds her child to signify her support and nurturing for the family and business.They are handsome and stylish with the gesture of victory. They assist you in gathering fortune while you are outside.